The quarter of June witnessed many ups and downs in the real estate industry, particularly related to the patchy performance by real estate companies. Majority of the realty firms with greater exposure to the residential real estate saw higher losses as they adapted their accounts to the new guidelines under the Indian Accounting Standards 115 (IndAS). However, the way post a bumpy 2018 looks clear and optimistic. The reason is that many key developers are prepping up for new launches in the financial year of 2019. These new projects had received setbacks in 2017, mainly due to the time it took developers to adhere to the norms laid down by the Real Estate (Regulation and Development) Act, 2016, (RERA). To begin with, Sobha Ltd., the multinational realty developer, has launched a 1.3 million sq.ft. development project at Mysuru in the June quarter, and had released land for additional development. Similarly, Bengaluru-based Brigade Enterprises Ltd. will begin the development of nearly 7.8 million sq.ft. of residential projects in FY19. DLF, India’s largest commercial real estate developer, is progressing towards gaining fresh sales booking of Rs. 2,250 crores in this financial year. Other giants like Oberoi Realty Ltd., Godrej Properties, etc. are all set to launch new residential projects. The data by real estate consulting firm Anarock also confirms this trend. According to data collated by the firm, there has been an increase of 10% in the number of new launches across the top seven cities in India. This rise has been recorded in the first six months of 2018 from a year earlier. The major reforms in the industry have begun to pay off, ushering in the much-needed transparency that is ultimately benefiting customers and stakeholders. “We may see nearly 15-18% increase in the number of new launches in H1 2019, which could be anywhere between 96,000 units to approx. 98,600 units,” adds Anarock. However, in regions like the NCR and MMR, there is still a huge inventory of unsold homes, yet it is much lower compared to what it was two years ago, which investors should be aware of. 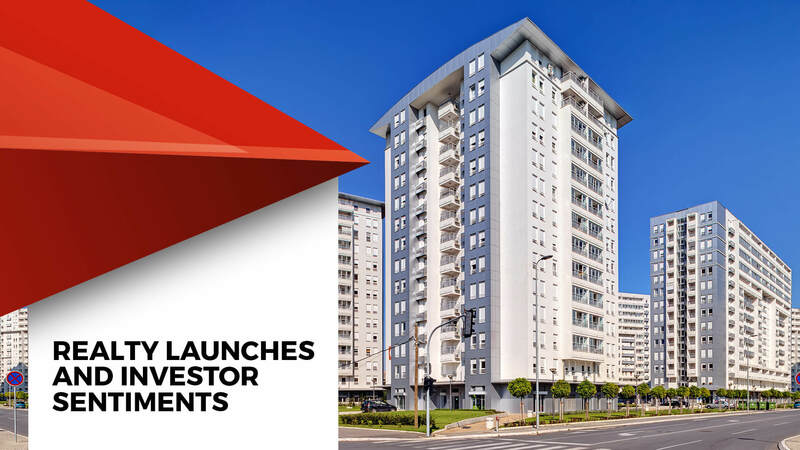 Besides, new launches in different real estate segments are expected to create cash inflows. RERA, along with the huge inventory had lead to developers postponing their projects, which resulted in the scarcity of new projects in the last year. Moreover, big and small builders are focusing on the affordable housing segment due to the growth it is expected to produce. A mirror to the rising investor sentiments is the BSE Realty Index, that is finally showing an uptrend after a prolonged period of decline. The varying market conditions may produce varying revenue and profit. Therefore, investors should have a more realistic approach with regard to earnings from the sector.